A 3D titanium printed edition of a Canyon Diablo meteorite, a silicone replica of a human hand. That What Makes Us Human makes a critical analogy with a scene in the movie 2001: A Space Odyssey - The Dawn of Man which ends with an incident where one ape kills another with a bone which signifies the ugliness of modern humanity. The ape throws a bone into the air as a sign of victory, after which the audience is directly diverted to an orbiting nuclear satellite in outer space, transitioning millions of years in the future. The bone illustrates mankind’s evolutionary step and the satellite is the futuristic outcome. This scene shows the beginning of the Palaeolithic Era and reveals that, 'by the usage of tools, man could stop being a victim of the world to become an active element, who has the power of action over nature'. 3D printed 1:1 titanium facsimile of a Canyon Diablo Meteorite, silicone replica of a human right hand. 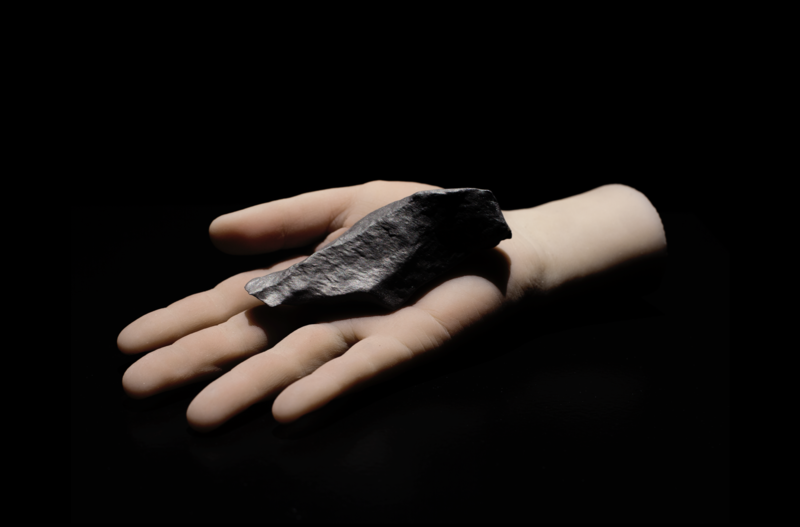 That What Makes Us Human consists of a titanium 3D printed titanium facsimile of a metal meteorite that fell down from space, and is shaped similarly to the flint tools we used at the time of impact around 50.000 years ago. The meteorite fits ergonomically perfectly in a human hand and can be used as a weapon or tool. The impact happened at a moment in human history which for a long time has been marked as the period when we became ‘human’ and suddenly more rapidly started to develop modern cognition and behaviour according to some scientific theories. 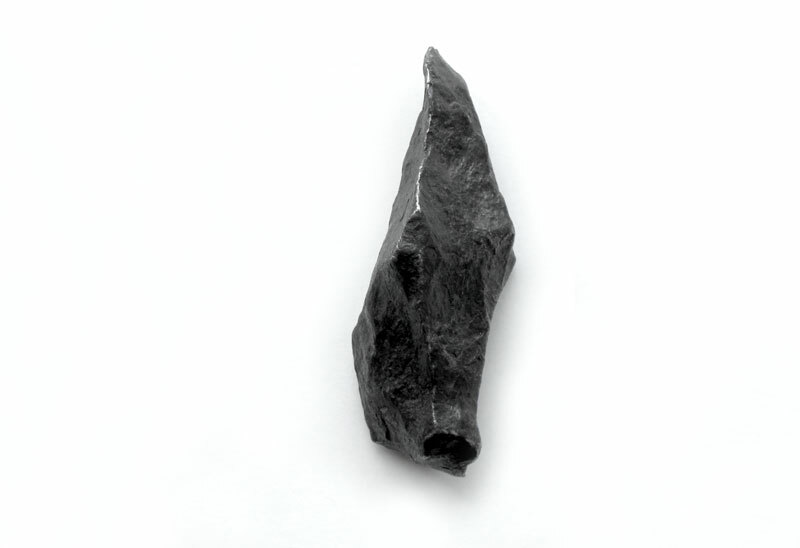 The evolution of tools and weapons led eventually to the development of a new technological device that would make a similar physical impact on earth as the meteorite. The impact and energy release of the Canyon Diablo meteor from space was similar to the first hydrogen bomb 10.4 TNT (Ivy Mike), our biggest attempt to come close to having ‘cosmic powers’. At the moment we have so many H-bombs on earth that we can make a bigger impact than the asteroid that wiped out the dinosaurs and a significant fraction of other life on Earth. The sculpture is a speculative artefact relating to this evolution of technologies and our quest for powers on a non-human scale.